Fiction – paperback; Allen & Unwin; 304 pages; 2014. Review copy courtesy of the publisher. 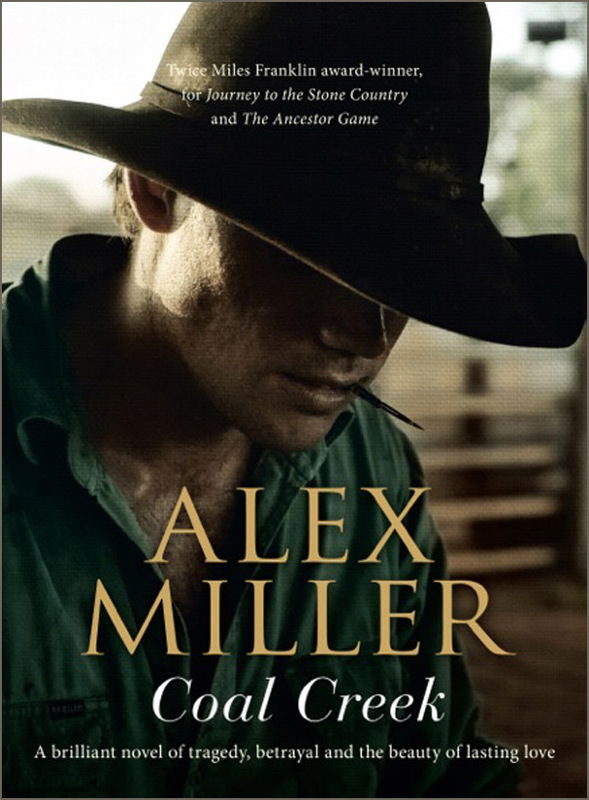 Coal Creek, published in the UK earlier this year, is typical of what I have come to expect from Alex Miller’s writing: quietly understated prose, slowly paced narratives, characters who are deep thinkers and themes which are universal. This story, set in the Queensland outback in the 1950s, unfolds gently but culminates in violence. The narrator, Bobby Blue (short for Robert Blewitt), is a simple man with a strong moral compass, who finds it difficult to express himself so usually says nothing — occasionally to his disadvantage. He left school as a 10-year-old (“my mother never did get the chance to teach me nothing”) and became a stockman with his father and two others. Later, after the death of his father, he decides to work for the police, putting his horsemanship and knowledge of the bush to good use, tracking thieves and stolen stock and helping to settle the odd property dispute. His boss, Constable Collins, is an ex-soldier who survived World War Two’s New Guinea campaign. He grew up on the coast but has accepted a bush posting, dragging his wife and daughters with him. He’s a bit out of his depth and is struggling to adjust to the scrub — he’s no natural bushman, which means he is increasingly reliant on Bobby’s skill and knowledge, although he is too arrogant to admit it. There’s not much crime to investigate apart from the odd family feud and a bit of cattle rustling. Indeed, the previous constable used to turn a blind eye to much of this because he preferred to let people sort things out for themselves, but Collins is different: he only ever sees things in black and white, and believes his job is to police the community in the strictest possible sense. So, when an old aboriginal woman claims that Ben Tobin, an old school friend of Bobby’s, has hit Deeds, his aboriginal girlfriend, Collins is ready to throw the book at him — despite a lack of evidence. And so Miller sets up his key theme — that of the stranger in a strange land (Collins) doing a job for which he’s ill-equipped — and pits him against the seemingly naïve and silent local (Bobby), who knows the landscape intimately and feels, if not at one with it, certainly a part of it. The narrative, told entirely from Bobby’s point of view, is written in the voice of a simple, uneducated man — complete with grammatical errors — who desperately misses his late mother and is starved of female company until Collins’ wife, Esme, encourages him to share meals with her family. Through this, Bobby develops a close friendship with the Collins’ 12-year-old daughter, Irie, who teaches him to read. But while these were simpler times and Bobby seems strangely asexual, this relationship between a man and a prepubescent girl threatens to destroy everything that Bobby holds dear. And while I would describe Coal Creek as a proper slow burner — it took me a long time to get into — the story has a funny way of sneaking up on you and then holding on. This is largely due to the strong voice (and the wonderful storytelling), which puts you in the head of a narrator who is relating the story as it happened to him in the past (remember, things happen slowly in the bush). And because he often indicates that he wished he’d done or said something differently, a sense of doom, melancholia and regret begins to build. There’s lot of foreshadowing so that you know the narrative is going to culminate in an unhappy ending or dramatic event. But what I liked most about this novel is the ways in which the landscape dominates the entire story; it’s beauty and strangeness, the way in which it makes man very small and insignificant, is a metaphor for the conflict between Bobby and Collins — that to survive in this land you need to understand it, or at least respect it. We are only men. When you live as we had lived our lives in the scrubs you know you are not the boss of nothing and there is the sky and the eagles and the scrubs going on forever into them great stone escarpments. No man knows himself to be the boss of that. Essentially Coal Creek is a love story — not only Bobby’s love for Irie, but of his mother and of the landscape and way of life. It’s also a very good examination of loyalty, trust, male friendship and the ties which bind mothers and sons. And it’s an eye-opening look at black and white relations, and the way in which remote rural areas are policed. It is very much typical Alex Miller fare: richly evocative, intelligent and unsentimental, tethered to a strong sense of place and peopled by well-drawn characters. Don’t let the slow pace turn you off: this is one of the most absorbing stories I’ve read all year. Great review, Kim. I agree with you about the way the novel sneaks up on you. Miller always surprises me though with the range of things he can do: in ‘Autumn Laing’ he showed how laugh-out-loud funny he can be, a trait I hadn’t previously associated with him, and in ‘Coal Creek’ he takes a slow start and builds it up to an almost thriller-like intensity in the last half of the book, which I haven’t really seen him do before. And as you note, the landscape (as ever with Miller) is a huge presence. The next Miller I read after ‘Coal Creek’ was his first novel ‘Watching the Climbers on the Mountain’ and it was fascinating to see the way he had almost come full circle, since that early novel has a fairly similar set up. ‘Coal Creek’ also reminded me quite a bit of Larry Watson’s ‘Montana 1948’. I’m now trying to ration my Alex Miller reading to perhaps one a year as I only have two more to go – ‘The Tivington Nott’ and ‘The Ancestor Game’. Though I’m sure I’ll reread them all at some point. You’re right about the almost thriller-like intensity towards the end of the book… though it does take a very long time to build up to that, but definitely worth the long wait. I’ve yet to read “Watching the Climbers on the Mountain” but will look forward to reading it at some point… I’ve got a stack of Miller books in my wardrobe (who needs clothes?) waiting to be devoured, but he’s not an author to rush through, I don’t think. I am reading Miller in chronological order, so it will be a few years before I get to this one — but I am already looking forward to it. I thought while reading your review that the plot structure had similarities with Watching the Climbers (as David notes in his comment). I am guessing that Miller returned to that tension between the landscape and people who are uncomfortable in it because he felt his first novel had left some aspects under-developed or overlooked. It is a frequent theme of Canadian authors who write about the frontier, so I am looking forward to this latest version. He’s very good at depicting the tension between the landscape and the people, a common theme done very well by many of Australia’s “star” writers, including Patrick White, Tim Winton, Thea Astley and (the much-overlooked) Randolph Stow. Have you ever read Patrick White’s Tree of Man? That’s the best exploration of Australia’s “frontier” and I’d think you’d appreciate it. Not very much happens in it, but you follow the lives of a pioneer couple who build a hut and try to make a living from the land. Read it in my early 20s and it still haunts me. One day I might re-read it again.